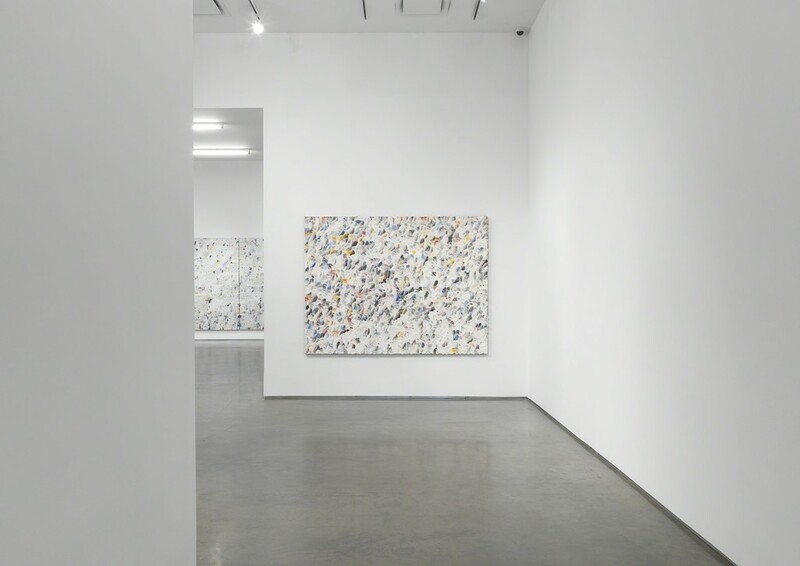 Marianne Boesky Gallery is pleased to present sometimes we circle the sun, Los Angeles-based artist Dashiell Manley’s second solo exhibition with the gallery. Featuring a selection of new large-scale oil paintings, the exhibition sees Manley transition from his direct engagement with breaking news cycles, into more personal meditations, exploring his own experiences within today’s global happenings. 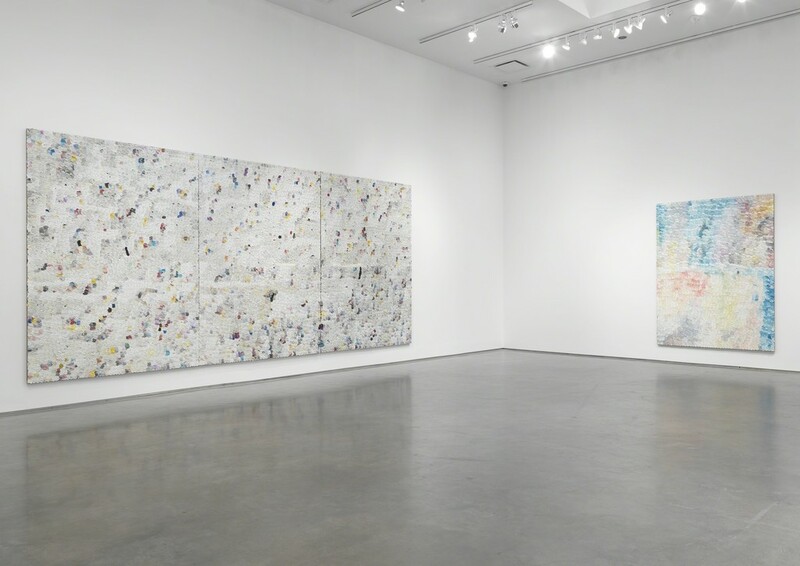 With this shift, Manley also delves more deeply into the formal relationships and boundaries between material, mark, and picture plane, using the canvas as a space to physically shape his emotional and psychic responses. sometimes we circle the sun will be on view from September 6 through October 20, 2018 at the gallery’s 509 W. 24th Street location. Manley’s practice has been characterized by focused, repetitive, and often times labor-intensive techniques and processes. From the New York Times series, in which he transcribed and abstracted the front pages of the newspaper, to his Various sources (quiet satires), for which he reproduced, altered, and collaged political and topical cartoons, Manley’s early work emphasized systems of production as means of understanding and exploring difficult subjects. With his Elegy series, which he began developing in 2016, Manley began to shift away from analytical manifestations to more emotional and psychological expressions on the canvas, allowing himself to open up his gestures and movements. With this new approach, he established a singular technique—sculpting the oil paint with a palette knife—that resulted in colorful, highly-textured, abstract canvases, that in instances encapsulated sharp cuts of paint and in others soft undulating effects. With his newest body of work, Manley extends the process he began with the Elegy series, expanding his gestural vocabulary to be further evocative of his personal reflections. Inspired by a range of artistic genres and movements, including landscape painting and the Ukiyo-e woodblock paintings and prints of the Edo Era in Japan, Manley merges these references with his own ongoing and systematic working of the oil paint and canvas. With this new emphasis, Manley’s canvases have also increased in scale, providing a wider surface plane for formal experimentation. 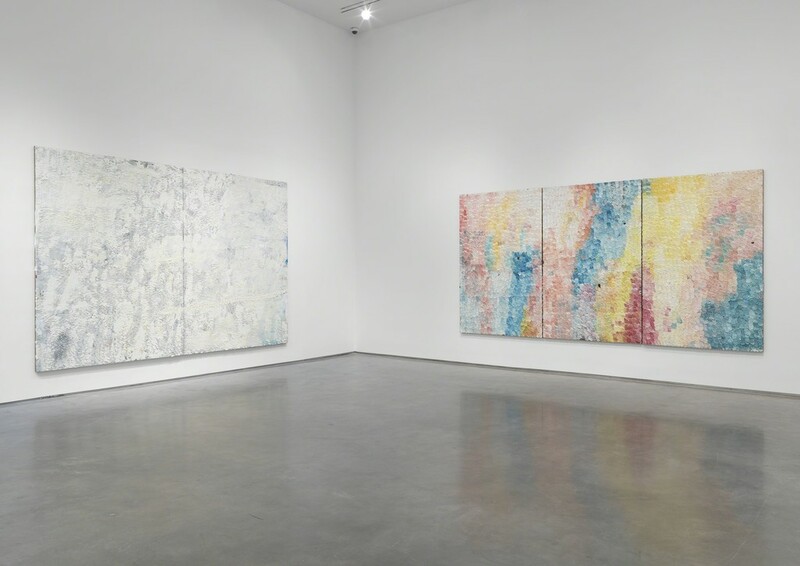 Evolving organically as Manley has altered and developed his processes, the works have emerged as kinds of abstract landscapes, connected by the subtle, at times almost imperceptible, appearance of a horizon line that bisects the canvases at their midpoint. Here, Manley’s painterly marks also shift direction, imbuing the works with a sense of fluidity and motion, as they are viewed from different angles and distances. This sensation is particularly vivid in the multi-panel work, titled 3. to rot or rise, the dead leaves sing, which anchors the exhibition and measures 110 by 240 inches, occupying the majority of the gallery’s back wall. As the vision for his work has evolved, so too has Manley’s cadre of techniques. Where the original Elegy paintings were created through an additive process, with Manley building up the texture and color over time—sometimes starting a painting and completing it several weeks or even months later—the new works also incorporate a reverse process in which Manley coats his canvas in a thick layer of oil paint and then methodically carves it to reveal his marks. This new process is then combined with a further additive sculpturing of the oil paint. The intense working and layering of the paint produces an almost alchemic response that alters the texture and quality of the material, creating a visual complexity that at once inspires a sense of awe and meditative quietude. These newest works will be presented with a selection of works that represent the evolution of Manley’s approach, mapping the trajectory of the conceptual and formal underpinnings of his work. 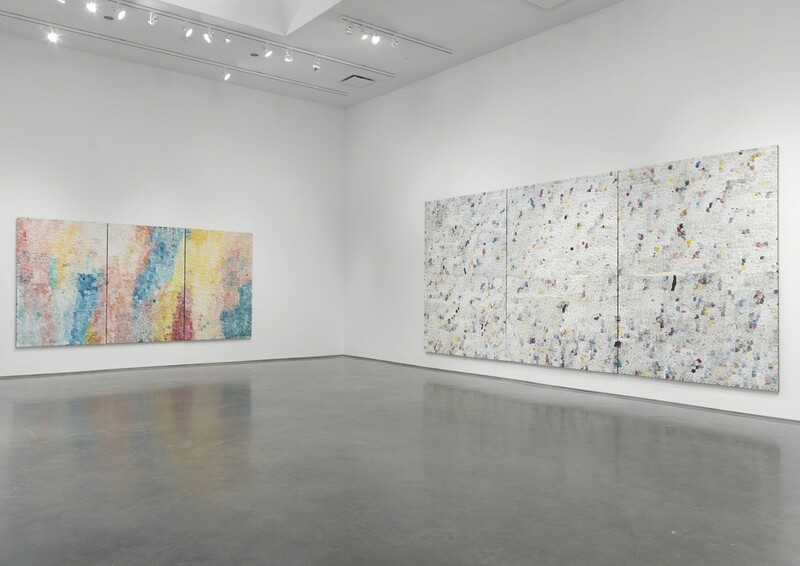 Manley’s work has been included in exhibitions at renowned institutions across the US, including in solo exhibitions at Los Angeles Nomadic Division (LAND) in 2017 and at the Cantor Arts Center at Stanford University in 2016, as well as in major group presentations such as the 2014 Whitney Biennial, and the 2012 Hammer Biennial. He has previously exhibited in Sao Paulo, Sydney, Torino, Vienna, Austin, New York, and Los Angeles. His work is in the public collections of the Los Angeles County Museum of Art and The Hammer Museum. 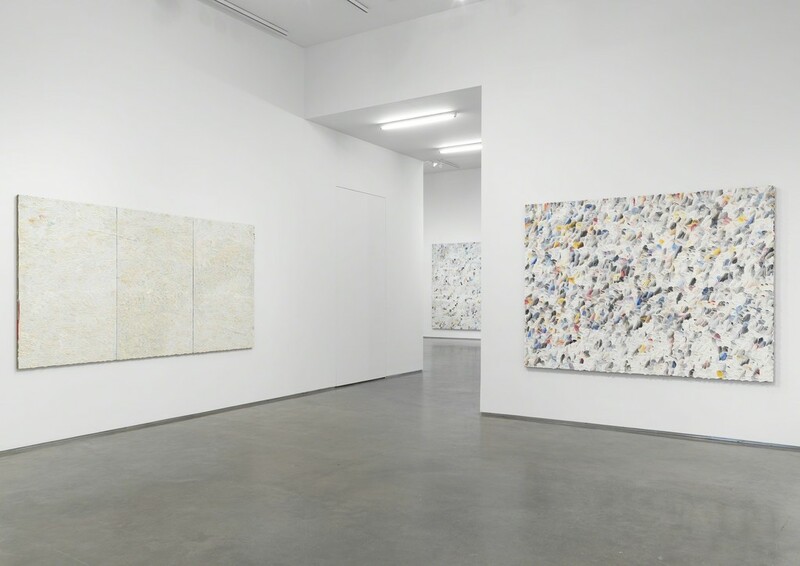 Jessica Silverman Gallery published a catalog featuring his New York Times paintings in 2015. Manley (b.1983, Fontana, CA) received his BFA from Cal Arts and his MFA from UCLA. He joined Marianne Boesky Gallery in February 2016. He lives and works in Los Angeles, CA. For more information about Dashiell Manley, please contact Gallery Director Kelly Woods at [email protected] or 212.680.9889. For press inquiries, please contact Alina Sumajin, PAVE Communications and Consulting, at [email protected] or 646-369-2050.